#loweclass blogs about learning that students of color weren't always welcomed at Marquette, and considers how to go about telling EOP's story via a final class project. Blog posts from students who attended an inauguration event focusing on how EOP came to be – and how the university helped spread the program across the nation. EOP founding director Arnold Mitchem reflects on his life's work, saying "I'm very grateful that I had the opportunity to involve myself in the lives of so many." EOP requires that all of its first-year students receive tutoring for at least one class; other students may take advantage of it through graduation. #loweclass reports on this crucial program benefit. For 45 years, EOP helped to shape futures and create memories on the fourth floor of Marquette Hall. #loweclass reports on how staff feel about the program having to relocate recently to Coughlin Hall. The former Marquette men's basketball player (1966 to 1969) reflects on how his team advocated for diversity on campus. The physician ('92) shares how EOP helped create the chance to extend his spirituality through medicine and community service. The recent Marquette alumnae (Ed '13) talks about the standards of hard work and dedication that EOP sets for its students. The assistant professor and McNair scholar mentor (Nurs '97, Grad '01, '10) describes the family bonds that form within EOP. The program's retired director discusses how EOP welcomes its students into a special close-knit community at Marquette. The former office secretary of 32 years – also known as the "EOP mama" – recalls her special relationship with students. 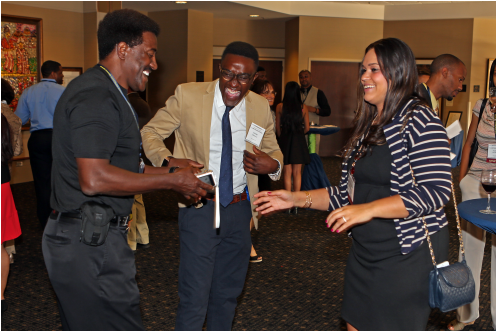 Click here to view photos of EOP alumni, staff, current students and supporters who came together on Marquette's campus to celebrate the program's 45th anniversary during two days in July 2014. 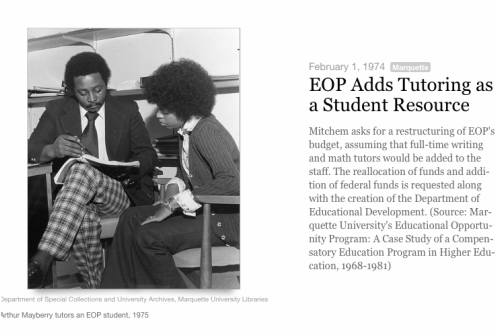 Click here to view an interactive timeline recounting what led to the founding of EOP at Marquette, how its new leader helped spread the concept across the nation and some of the program's milestones. Nearly 2,000 men and women have graduated from Marquette University's Educational Opportunity Program since it was founded in 1969. The vast majority of them went to high school in Milwaukee. #loweclass found that most EOP students graduate from the College of Arts and Sciences, followed by the College of Communication; that female students outnumber those who are male by a ratio of three to two, and that 60 percent of those served by the program are African American – a considerably lower number than in its early years. This website was created as part of a fall 2014 digital journalism course in the Diederich College of Communication at Marquette University. Led by instructor (and EOP alumnus) Herbert Lowe, #loweclass consisted Elizabeth Baker, Brittany Carloni, Thomas Conroy, Jenna Ebbers, Estefania Elizondo, Dewayne Gage, Henry Greening, Madeline Kennedy, Madeline Pieschel, Teran Powell, Natalie Ragusin, Roque Redondo, Caroline Roers, Devi Shastri and Robyn St. John.